Due to VERY HIGH DEMAND this time of year, PLEASE contact us if you need your order by a specific time to insure we have it in stock! 3 Strings or 2 Ropes! Please Contact Us For Special Orders. Special Orders require 10 Business Days for Shipment. No refunds, returns or exchanges on Special Orders. Left Handed Ropes are Special Order Only - 3 Strand Only. Call for available lays and sizes. Additional $5.00 charge on left hand ropes. Shipping to PO Boxes and APO Boxes is Not Available. Also, please contact us directly for shipping methods other than UPS Ground. We will contact you directly using the information supplied if we decide that you are the right fit for Lyles Ropes. Please do not contact us to inquire about your application. ***NEW! - The Smoker - 35 ft. The Smoker 4-Strand, a nylon/poly blended rope, is available in 2 sizes the Lite and the Ulite . The Smoker is a light weight rope but still has the full body feel. Now stocking the Wasp poly calf rope with the breakaway Honda! Please call for pricing and available sizes. All our Hats and T-Shirts are on sale for ONLY $15! 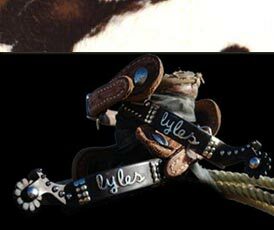 Apply to be Sponsored by Lyles Ropes! Contact us for Dealer Opportunities!